In PTC Windchill 10.2, users have enhanced functionality to manage Windchill documents through Windows Explorer. 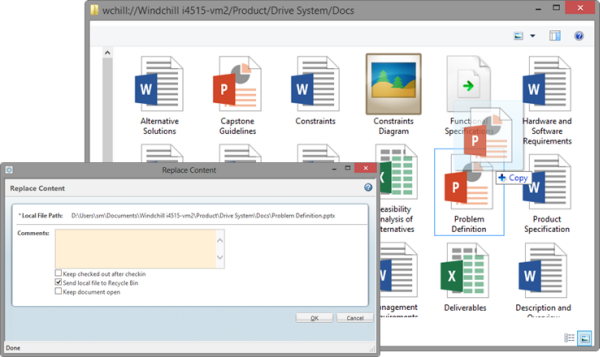 Ability to replace content using drag-and-drop functionality: Users can drag and drop files in Windows Explorer to replace the content of an existing Windchill document. Additional Windchill actions added: The right-click menu in Windows Explorer includes a wider range of Windchill actions. In previous releases, only actions such as Open and View Information were available. 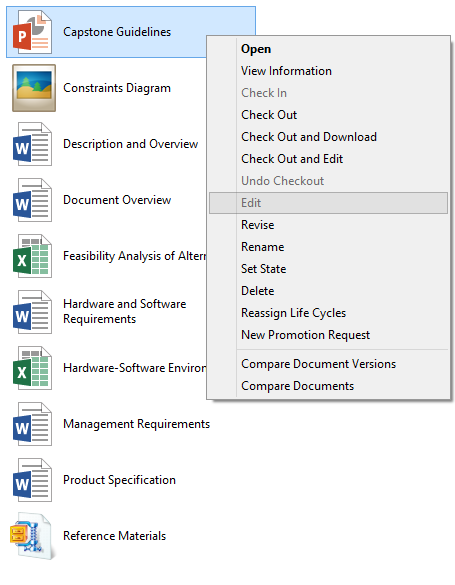 Ability to compare documents and document versions: New actions have been added to the right-click menu in Windows Explorer. 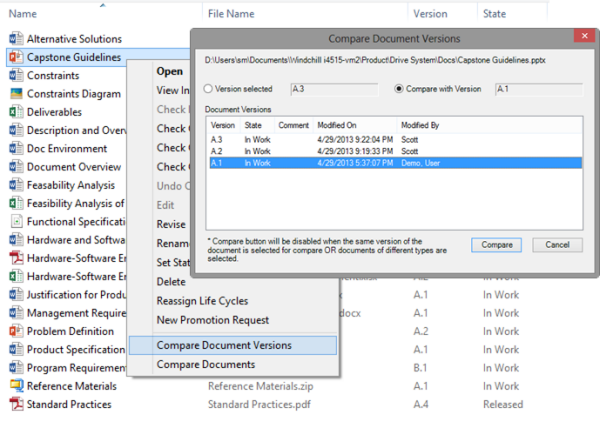 These actions allow users to compare document and version information. Windchill provides this functionality for certain versions of Microsoft Excel, Microsoft PowerPoint, and Microsoft Word files. However, users can configure Desktop Integration to identify additional comparison tools to support more file types. Select content during checkin: When a right-click checkin action is used and a modified version of that document exists in the cache, then Desktop Integration uploads that document during checkin. 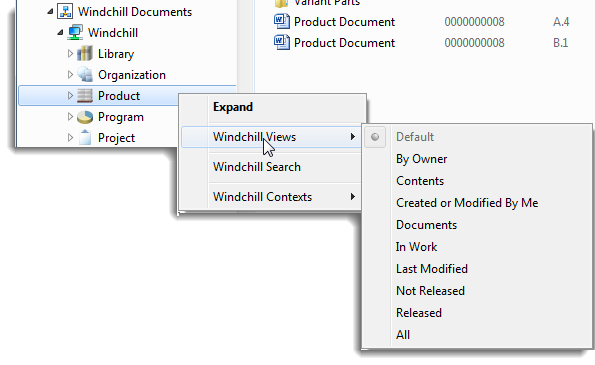 Applying Windchill folder views to Windows Explorer: Users can select a Windchill table view to apply to the Details view columns in Windows Explorer. This includes both default and customized folder views. Searching for Windchill documents from Windows Explorer: A new Windchill Search action is available from the right-click menu for context types, contexts, and folders. Displaying the latest document revision: In previous releases, Desktop Integration users saw the latest version of each document revision in Windows Explorer. Starting in 10.2, only the most recent version appears. Additional Windchill actions are available from the right-click menu in Windows Explorer. The Replace Content window opens when users drag and drop a file on top of a checked-in document in Windows Explorer. Select a default or customized folder view from the right-click menu of a context type in Windows Explorer. A built-in comparison tool is available for Microsoft Word and Microsoft Excel documents.